ARE MOST IT ORGANIZATIONS STILL UNPREPARED FOR DIGITAL BUSINESS CHANGES? Being in the fastest digital transition in history is truly exciting as technology re-defines how we live and work. We all seem to understand the power of innovation and how crucial it is to keep evolving our businesses at a (rapid) pace. 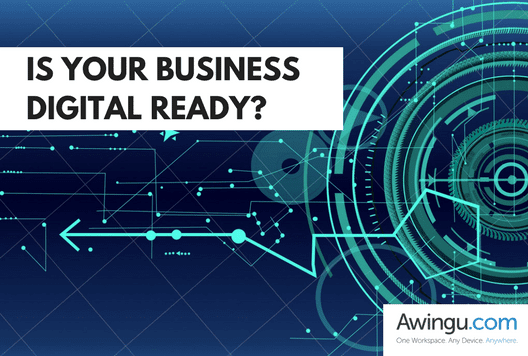 DO YOU THINK YOUR BUSINESS IS DIGITAL READY? A 2016 Gartner survey found out that 59% of surveyed IT professionals think that their IT organization is unprepared for the digital business of the next two years. (1) This brings out a new issue on the tech-horizon. Why is this number so high and what can we all do to improve the confidence of CIOs worldwide? Skills, research, and experience are crucial to take the next steps in every successful digital transformation and there is a big weight on the shoulders of IT roles to “make it happen” for their companies. It’s expected from them to get the required skills fast, do every possible research, test out and integrate new models into the existing infrastructure. Many of surveyed professionals identified cloud, data, and analytics as skills gaps that their organizations were trying to fill in relation to information, technology or digital business. They also pointed out the lack of general technical skills (indicating a lack of broad technology knowledge), as well as in the fields of security, legacy modernization, mobility and the Internet of Things. According to the Gartner survey, the areas that will most influence IT professionals’ jobs and careers in the next 18 months are considered to be cloud computing, analytics, mobility, and security. (1) Without any doubt, these topics together with AI and Internet of Things are the focus of many IT departments. One of the most important gatherings of CIOs and Senior IT executives, the Gartner ITxpo is taking place in Barcelona from 5th until the 9th November and we can’t wait to find out more about the mentioned topics. If you see your company in the 59% of “digitally unprepared” businesses, Gartner symposium is going to be a great place where you can start building your digital strategy. Expected 6000 CIOs and IT executives will turn Barcelona a center of the IT world in those four days. The knowledge and ideas presented at the symposium will motivate you to start a proper digital change for your organization. Awingu, as one of the main players in the online workspace market, will also be present at the ITxpo. In case you wish to meet us at the Symposium, click here and we will be happy to talk with you how to make your business digital ready.